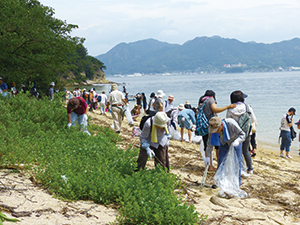 In order to protect the natural landscape and rich biodiversity of the national park, efforts have been made to promote the conservation and survey of wild fauna and flora, as well as the natural landscapes, including the protection project and population survey of Miyajima dragonfly, beach clean-up, investigation of proposed sites for marine parks, and other various projects through cooperation with involved parties. In collaboration with park volunteers and nature guides, a wide array of nature programs are offered seasonally including nature observation meetings centered on use locations in Mt. Washu and Miyajima Island. 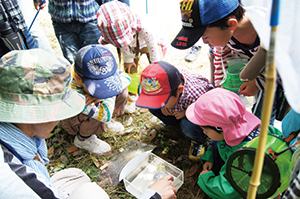 Also, various projects aimed at learning the importance of nature and environment are offered targeting children as junior park rangers. In order for visitors to get the most out of the national park and interact with nature safely and comfortably, the park facilities such as visitor centers, trails, and campgrounds centered on Mt. 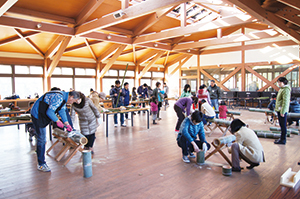 Rokko and Goshikidai Plateau are maintained in a good and safe condition.